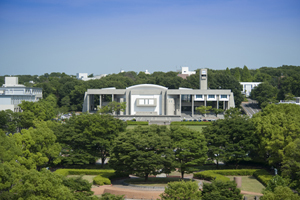 Nagoya University-led research team shows in mice the potential of a special immune cell that targets a key protein in tumor growth that helps stop brain cancer. 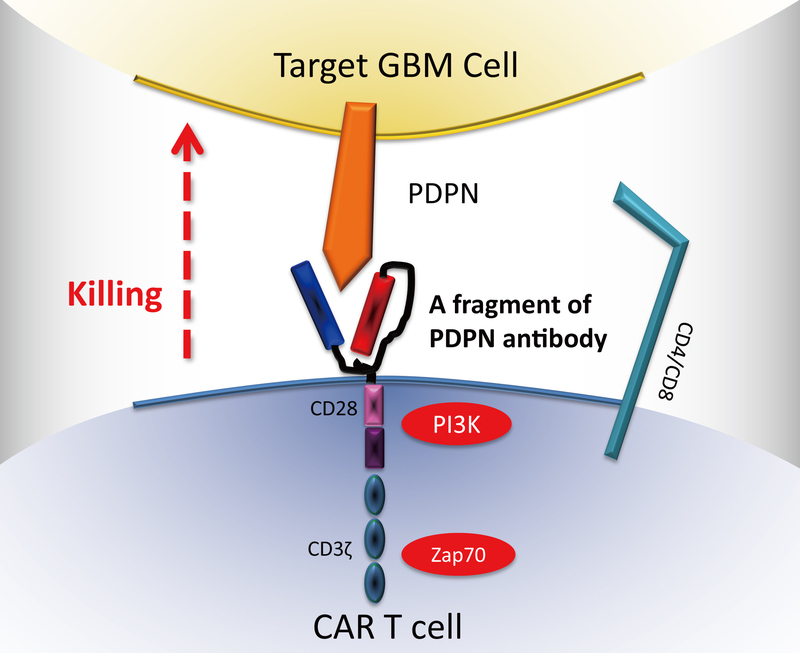 Caption: Chimeric antigen receptor (CAR) T cells CAR comprising a podoplanin (PDPN)-specific antibody fragment with CD28, 4-1BB, and CD3ζ intracellular domains are genetically engineered to target PDPN, a protein usually found in abundance in solid tumors, including GBM, which presents the worst prognosis among GBM subtypes. Infusion of CAR T cells into an immunodeficient mouse model led to inhibition of tumor growth. CAR T cell therapy that targets PDPN represents a promising immunotherapy for treating GBM. Nagoya, Japan - For decades most cancers have been treated with a core standard of treatments that include surgery, radiation, and chemotherapy. Now, immunotherapy--a type of treatment that harnesses the patient's immune system to combat the disease--represents the future of cancer treatment, with its efficacy being demonstrated in even the most aggressive types of cancer. Brain cancer comes in many forms, ranging from more easily treatable benign forms that may trigger gradual loss of brain functions, to malignant forms that can in many cases prove fatal. While there have been improvements in the current standard treatments, patients with glioblastoma (GBM), the most common and aggressive form of brain tumor, still suffer from a median survival rate of only 14.6 months and 5-year overall survival rates of less than 10%. There is therefore pressing need for novel therapies that improve the outcomes. Researchers at Nagoya University have been studying the therapeutic effect of T cells, vital disease-fighting components in our body's immune system, for fighting cancer. "Immunotherapy has emerged in recent years as a promising strategy for treatment of GBM," says Atsushi Natsume, corresponding author of the study and a member of the Nagoya University School of Medicine's Department of Neurosurgery. "We have successfully engineered T cells that produce special receptors on their surface, called chimeric antigen receptors (CARs), which allow the T cells to recognize specific proteins (antigens) expressed in GBM. We designed chimeric antigen receptor (CAR) T cells that specifically target podoplanin (PDPN), a key protein for the progression of solid tumors, including GBM." The research team found that injection of CAR T cells into 79 immunodeficient mice arrested the growth of GBM in 60% of them. Furthermore, the T cells can recognize PDPN on the tumor surface even with the absence of the body's own immune recognition system, which is usually compromised in cancer. "Considering that PDPN is associated with poor prognosis in GBM, CAR T-cell therapy that targets this protein is promising for treatment of patients with relapsed or resistant tumors following first-line chemotherapy," says Toshihiko Wakabayashi, a coauthor and the chair of neurosurgery in the Nagoya University School of Medicine's Department of Neurosurgery. "There are certainly challenges to overcome for clinical application of this kind of immunotherapy, but the newly published data are an important milestone in immunotherapy targeting solid tumors that have eluded other treatments." Authors: Dr. Satoshi Shiina, Dr. Masasuke Ohno, Assistant Prof. Fumiharu Ohka, Dr. Shunichiro Kuramitsu, Dr. Akane Yamamichi, Dr. Akira Kato, Associate Prof. Kazuya Motomura, Dr. Kuniaki Tanahashi, Dr. Takashi Yamamoto, Associate Prof. Takeshi Senga, Prof. Michinari Hamaguchi, Prof. Toshihiko Wakabayashi, and Associate Prof. Atsushi Natsume, Graduate School of Medichine, Nagoya University, with their research groups at the Shizuoka Cancer Center, Tohoku University Graduate School of Medicine, and Duke University Medical Center. Funding: This work was supported by Grant-in Aid for Scientific Research on Innovative Areas from the Ministry of Education, Culture, Sports, Science and Technology (MEXT; A. Natsume; #23107010) and Grant-in-Aid for Young Scientists B (M. Ohno; #25861270). 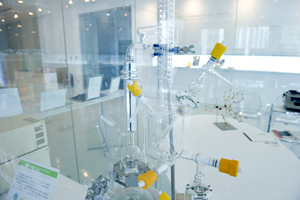 This work was also supported in part by the Platform for Drug Discovery, Informatics, by Structural Life Science (PDIS) from Japan Agency for Medical Research and development, AMED (Y. Kato), by the Basic Science and Platform Technology Program for Innovative Biological Medicine from AMED (Y. Kato), and by the Regional Innovation Strategy Support Program from MEXT (Y. Kato). 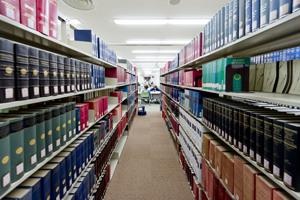 Copyright ©2010-2019 Nagoya University All Rights Reserved.